Chest Holsters have been in use since the very beginning of handguns. From underarm holsters, to tankers and chest rigs, chest holsters have a special place among firearm enthusiasts. In this article, we’ll be talking about the usefulness of a chest holster, and the qualities which make one an ideal and perfect choice. We will also learn about the benefits of a chest holster and under what situations one may come in handy. We have also handpicked and reviewed the best chest holsters on the market to assist with your decision making process. A chest holster, as the name suggests, is worn over the chest, either on the center, a bit sideways, or under. Perhaps, the exact position might differ according to the users' convenience. Needless to say, the foremost quality of any holster should be comfort. If your holster is not comfortable, you cannot wear it all day long. Nor will you be able to use it properly. The material of the straps should be soft, breathable, and easy on your body. Another very important feature of a good chest holster is the adjustment. The straps should be adjustable, along with the position and retention of the holster. Most chest holsters have extra hoops or buckles for the same. A chest holster should be easily accessible. It shouldn’t have a very high bulge or wobble, so you don't encounter problems while accessing your weapon. Finally, the chest holster must suit your weapon well. You must decide your weapon of choice before choosing a chest holster. Such that the holster provides a covered trigger guard, open/closed barrel end and proper fit. For example, S&W Magnum’ will not fit in a chest holster meant especially for Glocks. A chest holster is a comfortable and versatile choice for various uses, ranging from everyday concealed carry to hiking and hunting. Let's take a look at the best uses for a chest holster. A chest holder comes in handy when you go out hiking or on a camping trip. Unlike waistband holsters, the chest holster does not interfere with your large or small backpack. Additionally, they're also good for close encounters with predators as it ensures your hand does not get obstructed by your backpack/gear and nothing snags on to your handgun. 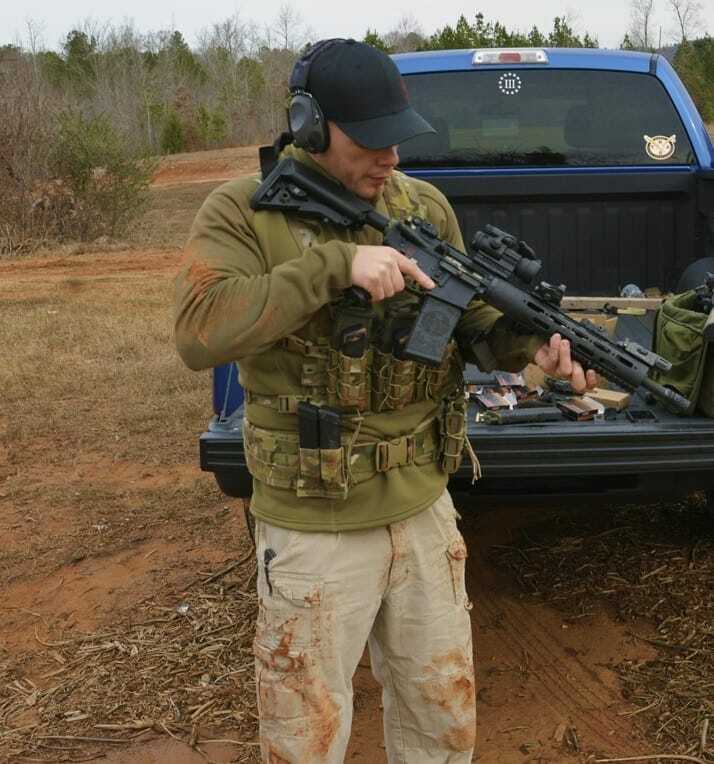 A chest holster ensures that nothing entangles or snags your holster while you move through woods or any other prone area. They secure tightly to your body and distribute the weight of the weapon perfectly around your torso. Chest holsters are also comfortable while sitting, working or driving. Consider yourself sitting behind the wheel and things go bad. The waistband draw is not a good option here as you will have to tilt or bend yourself to reach out your weapon. A chest holster comes in handy in such strenuous situations, requiring the least movement of your arm. On top of that, several chest holsters also have additional space for extra mags, which is definitely a plus under any situations. The waistband holsters might interfere with your rifles and rifle slings, but a chest holster solves that problem. Now we're going to switch gears and take a look at some of our favorite chest holsters. When discussing each model, we're going to highlight some main features and pros and cons to look for. Let's get started! 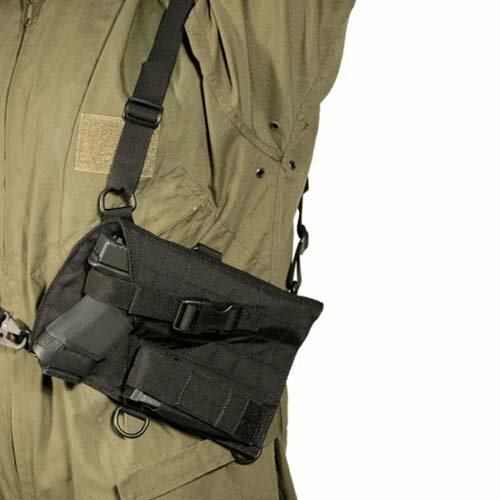 The Blackhawk universal spec-ops is a versatile all-in-one chest holster, meant to fit all purposes. This holster has been made from nylon, which is soft and comfortable over the body. This model will fit many types of handguns. The extra buckles on the sides of the holster allow it to be carried in vertical, horizontal or angled positions. 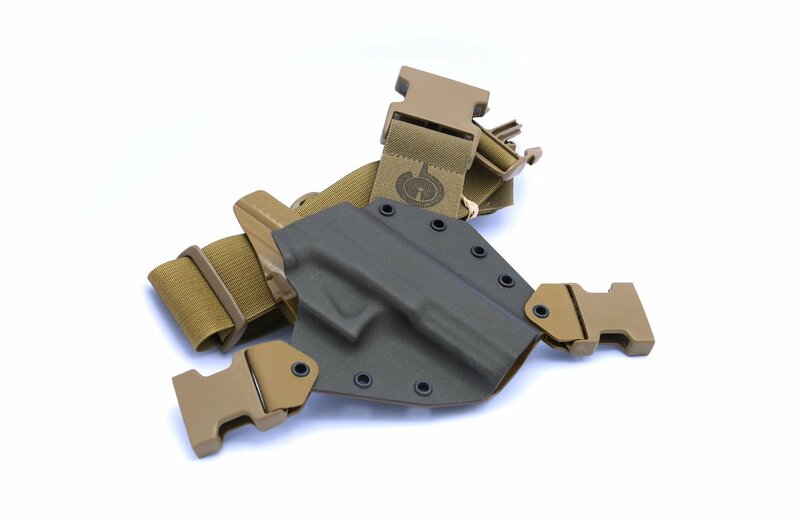 The holster is fully padded and adjustable on the straps as well as the holster. It also features a pouch beneath the holster to hold an extra mag. The only drawback is that it is right-handed and straps might fall short for a large guy. Not Suitable For Large Guys. Offers Limited Concealment (Not designed for that though). The Blackhawk Universal Spec-ops is a one-size-fits-all solution for carrying handguns. The padded design is comfortable and the extra mag pouch makes it even more useful. Multiple carrying angles and an adjustable design makes it quite versatile. Perfect for hiking, hunting, and open carry. The Kenai Chest Holster features a Kydex based molded design with a lot of adjustable length straps. The straps are long enough to make adjustments to fit very large people as well. It can be worn high or low on the chest, depending upon your preferences. These buckles are strategically located to keep the straps out of the way of backpacks or rifle slings. It fits most handguns, and the Kydex design makes it waterproof. Additionally, the holster is mini red dot sight compatible with Glock 21 models. The holster is also available for the Glock 23 and 32. Mini Sight Compatible For Glocks 20/21. The Kenai holster is a good option for people who are in search of a stable and waterproof chest holster, complemented with a good length of adjustable straps. This chest holster is good in all respects, except that it lacks proper padding; this might affect you when you wear it over a loose shirt. The Diamond D Redhawk chest holster features a simple leather design which sits comfortably on your body. The holster is easy to adjust and is secured by a buckle lock. The straps are adjustable and well adapt to all body types. 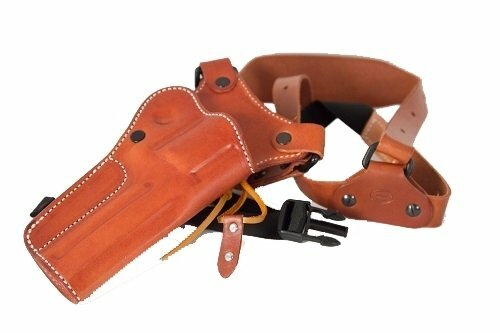 The entire holster is made up of leather, which is comfortable and will last longer. The holster suits only Ruger Alaskan which is obviously a setback. The holster is also available for the S&W N Frame Revolver. Handmade With Precision and Detail. Works Well With Large Body Types. Fits only 454 Ruger Alaskan. The Diamond D is a precisely handmade chest holster made up of comfortable leather. However, it is limited only to the Ruger Alaskan. It offers a sturdy holster for a large gun, but with minimal adjustments. Great for conservative shooters. The Man Gear Alaska is a versatile chest holster available in many sizes and configurations to adopt different types of handguns. It has been made with 1680 Denier Nylon and is comfortable over the skin. The metal D rings make the holster stable and allows it to be worn in three different ways. The holster is padded too, which allows for it to be concealed under the shirt comfortably. An extra mag pouch also helps users hold an extra magazine. A separate model of the gun is also available for Gen 2 Semi Auto and 1911 Pistols, and 4” Revolvers. Can Be Worn in Three Different Ways. 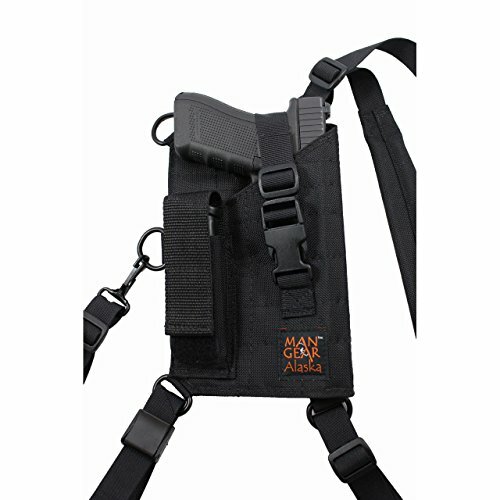 The Man Gear Holster is a simple chest holster that is lightweight and easy to carry. This holster is an inexpensive option for people looking for an instant and cheap solution. The buckle lock adjustable retention strap might make the draw time-consuming. Although, it is still a decent choice for many. Good for concealed carry and camping. 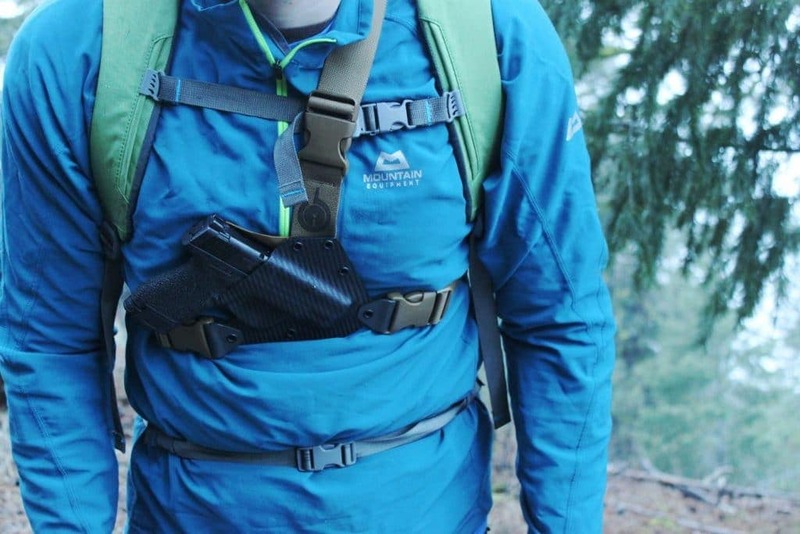 Chest holsters are an amazing accessory to carry your handgun safely while performing adventure activities like hiking, fishing, hunting, or camping. A good chest holster must be comfortable, easily accessible, adjustable, and should suit your weapon. Chest Holsters are perfect while carrying large backpacks as they don’t affect your draw. These holsters are also an easy-to-draw option in self-defense situations, in urban or wild areas.